Vegetation is widely varied and ranges from fynbos in the mountains to karoo broken veld, spekboom and succulent karoo on the koppies and plains. Several species are endemic to the Little Karoo. The area also has a unique thatching reed, Roodecoma arida. Freesia speciosa is found only in this district. A very rare bulb which appears here is Syringodea saxatilis. The fynbos include the rare Protea aristata and Protea pruinosa. Amongst the heath endemic species such as Erica toringbergensis and Erica insignis are found. Another endemic shrub to the Little Karoo is the beautiful Nymania capensis (Klapperbos). Certain areas at Koedoeskloof are recognizable as Scholtzbosveld, especially on the western slopes behind the cottages to the left. We suggest that you take a long walk early morning or late afternoon to see what you can identify. It becomes a fascinating adventure of discovery. Most obviously the Aloe Ferox (Bitter Aloe) which is scattered around the property as well as the pavement area to the right of the gate as well as the area surrounding the restaurant. Our Aloes are in full bloom displaying their orange red splendour in the first week of June and are a sight not to be missed. 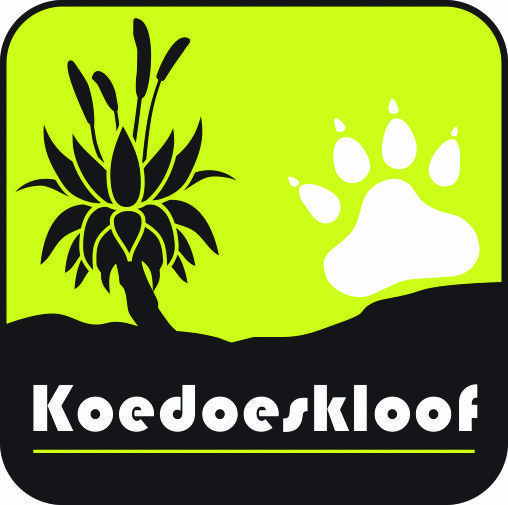 A stay at Koedoeskloof is recommended to take pictures of blooming aloes, snow covered peaks of Towerkop and abundant fauna and flora as both the weather and veld is beautiful at this time of the year (June – Aug). Many species of Mesembryanthemum or more commonly known as Vygies can be found at Koedoeskloof, especially after the winter rains in September when the veld is on show scattered with white, pink, yellow and purple varieties. A true feast for the eyes. Various other plant species can be found including Eucleum (Gwarrie), Lycium (Kruiebos), Gailenia (Kraalbos) and Euphorbia (Soetmelk and Melkbos). Various species of Albuca, Crassula, Cotyledon (Plakkie), Carissa Haematorcarpa (Karoo NumNum) and Spekboom. Stapelia, Aptosimim (Karoo Violet), various Euphorbias including Ystervarkbos, various Crasula species including Arborescens (Beestebul), Tetragonia, Andromischus Triflorus (Eendevoet), Capitella, Cotyledon Orbiculata (Plakkie, Pigs Ears) (Bergplakkie) and Cultrata, various species of Asparagus including Burchellii (Katdoring), Densifloris, Capensis, Mucronatus as well as Gymnosporia buxifolia (Pendoring), various Searsias which are pretty hard to tell apart. Hessia Stellaris (Sambreëltjie) flowers in late March after the first winter rains.